From the lush jungle terrain of the Cayo District to postcard perfect private islands, there are some very special places in Belize to enjoy that perfect sundowner , but we think that the prize goes to Azul Resort and Rojo Lounge on the exclusive north beach area of Ambergris Caye. With a legendary drink list (the key lime pie martini is to die for), delectable tropical lounge cuisine, fun and friendly staff and 400 feet of perfect white beachfront, the is the ultimate slice of paradise. 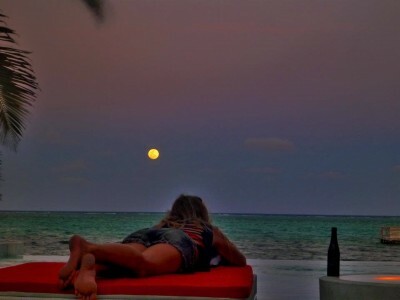 The picture was taken on the evening of the recent full moon courtesy of our friends from Belize Luxury Sailing. For more information about the resort view our accommodation page here.